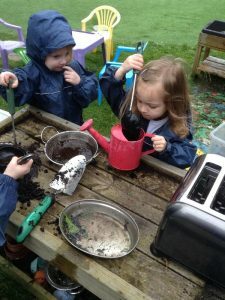 At Holy Apostles’ Pre-school the children have been learning about the rules for playing in the mud kitchen. The children at playgroup know that they have to be ‘booted and suited’ before they can join their friends in the mud kitchen. The suits hang up outside the pavilion for easy access; welly boots can be stored outside the pavilion too. Please make sure your child’s boots are named; you may leave them in our welly store if you prefer. We usually have some spares if your child forgets their boots! 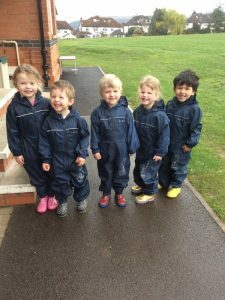 Children learn quickly that they need their suits and boots to join in the mud fun; this also has the advantage of limiting the number of children involved in the activity at any one time. 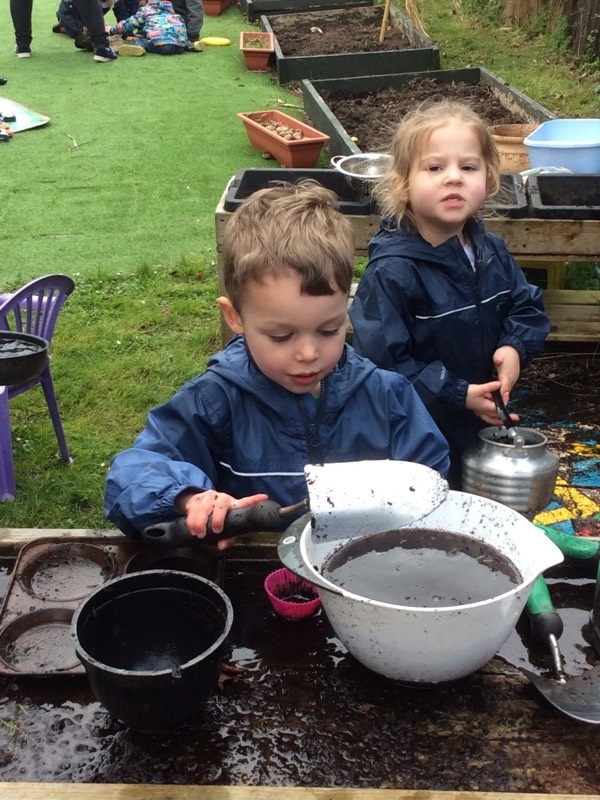 ALL children have been offered the opportunity to play in the mud kitchen and only a very few have refused so far but with encouragement may change their minds! There is little more important in our physical world than earth and water and they are truly intriguing things, especially when they interact. (Jan White online 2015). 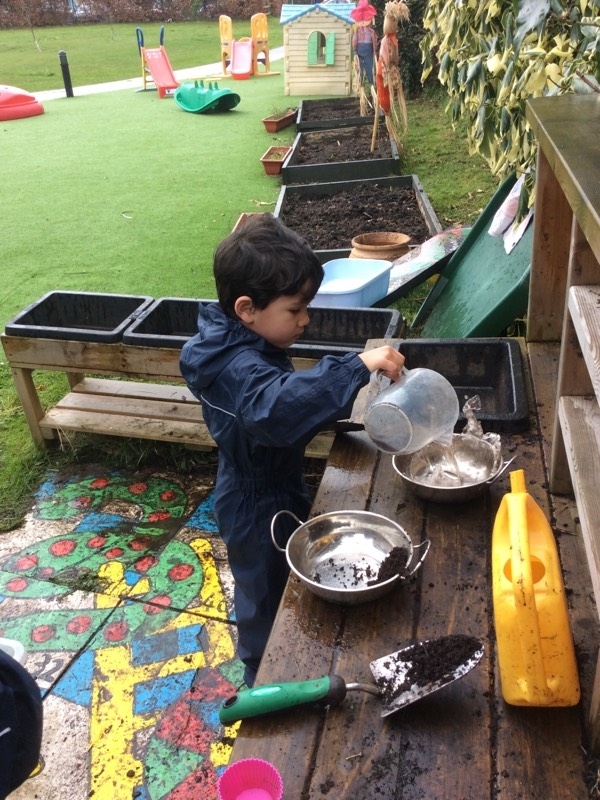 When the children decide they want to finish their session they wash their hands in the warm water provided close by and are encouraged to try to independently take off their boots and suits. 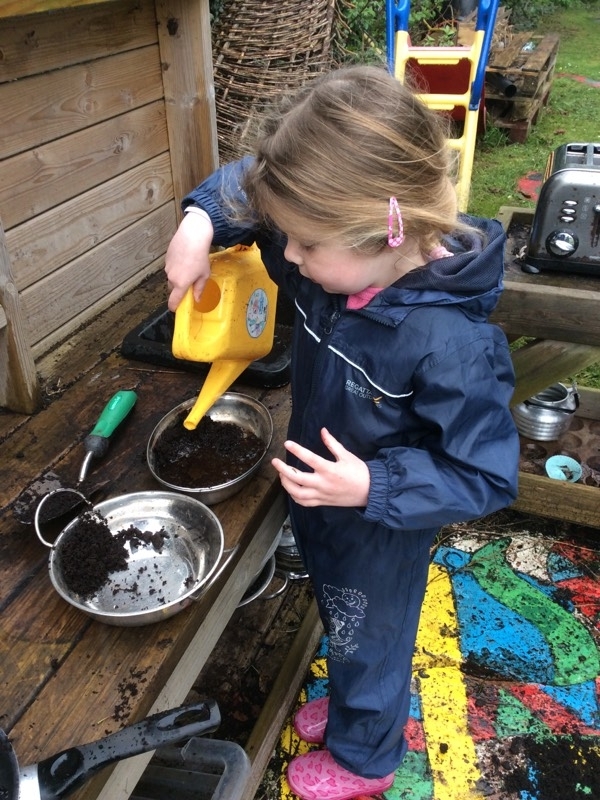 You can help your child with this activity by allowing a little longer before a trip out to enable them to ‘have a go’ at putting on their shoes and coat which is an essential skill to master for school! Understanding the World – observation skills, talking about found items, looking at similarities and differences and talking about why things happen and how they work. Expressive Arts & Design – opportunities for imaginary play are endless, the mix becomes coffee with frothy milk, a birthday cake, lotions & potions, perfume! 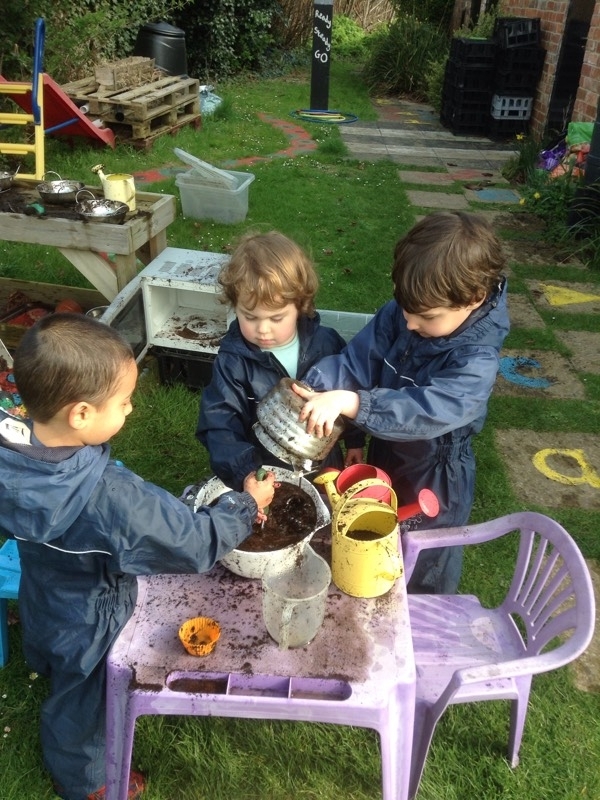 Literacy – mark-making in the mud, development of vocabulary through new experiences, linking stories to their role play. The process of making concoctions brings the worlds of science and art together with ‘possibility thinking’. 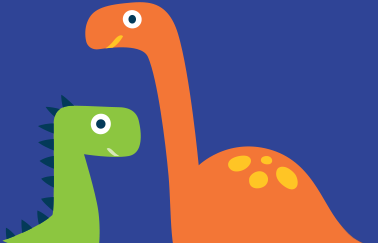 The opportunities for children to discover ‘what if …. ?’ On an even more powerful level the child becomes ‘an agent of change’ because the decisions about what to do next are theirs. First and foremost we have your children’s safety at heart; our job is to manage an opportunity and make it safely available. The whole area is risk-assessed daily and we will start to involve the children in this activity too. We purchase topsoil rather than using that from the borders. We also ensure that children wash their hands thoroughly at the end of the activity. Most of all remember that mud is fun! !